The deep (and sometimes disturbing) musings of a Blue Point Siamese. Oh we'd be so sad if that happened! It isn't gonna happen Maxwell. I think every creature would slip into depression! I think it might be happenin here! Aww Maxie- Now is the time for you to sing "the sun will come out tomorrow." Remember how well it worked for Little Annie? I bet it will work for you,too. Maybe all the kitties everywhere could sing along with you and bring sunshine all over the world. Sunpuddles for one and all, 24/7. Oh, Maxwell, that sounds like a nightmare! Wake up! Wake up! See the sun puddles! Oh my...you're going to give yourself high blood pressure with thoughts like that, Maxie! Yikes, may it not evfur be. We need our sunpuddles, oh MY we need them so much! Um, we're no sure we like that kind of thinking, Maxie! 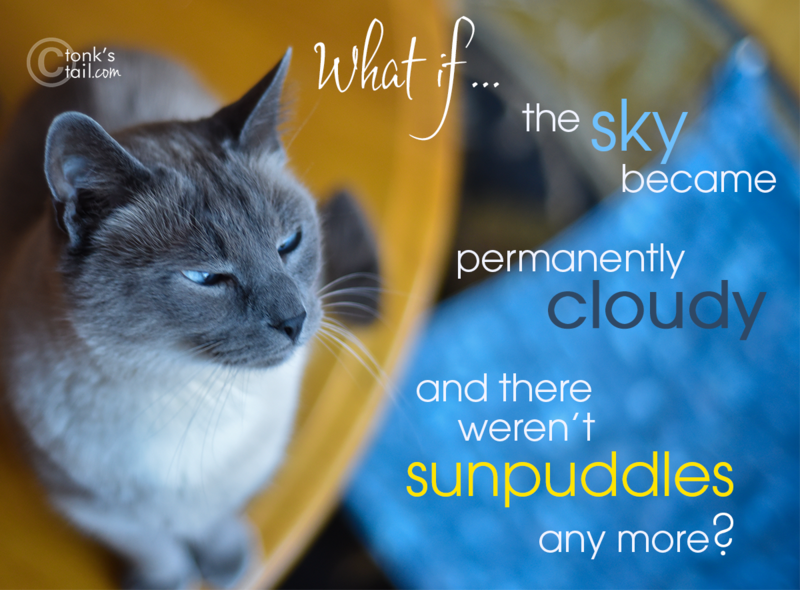 No sunpuddles? I'd be like the Wicked Witch of the West in The Wizard of Oz when doused with water ... kitties would shrivel into nothing but a cloud of smoke! I would have to spit up the biggest hairball ever! Dood, seriously, don't even joke about something like that.